Longest Snapchat Streak 2019: How to Increase Snapchat Streak? 1 What does snapchat streak mean? 2 What do the Emojis Mean on Snapstreaks? 3 How Do the Snapstreak Rewards Display? 4 How do I keep a snap streak going? 4.1 Method 1: Maintain snaps every day between you and your friends. 4.2 Method 2: send at least two snaps per day to avoid cleaning. 4.3 Method 3: Send a reminder message to your friends if they late for reply. 4.4 Method 4: add a value before your friend’s name to move their snap streaks to the top. 4.5 Method 5: sending photos or videos to your friends is better than the text messages. 5 How to Get Back a Lost Snapstreak? 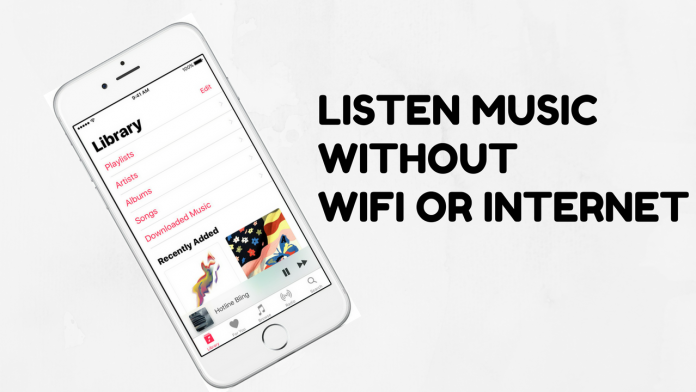 7 Wrap Up: How to Increase Snapchat Streak? 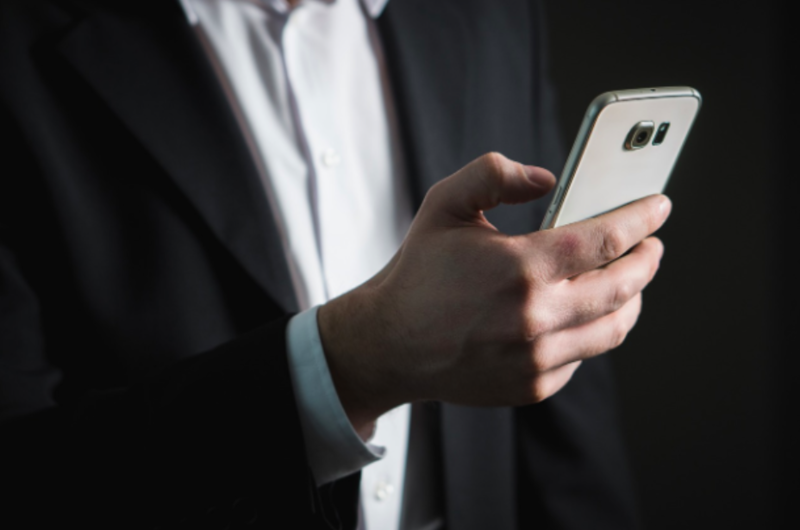 SnapChat is one of the most interesting and popular social media among the youth in order to get the longest Snapchat Streak to achieve the highest score. 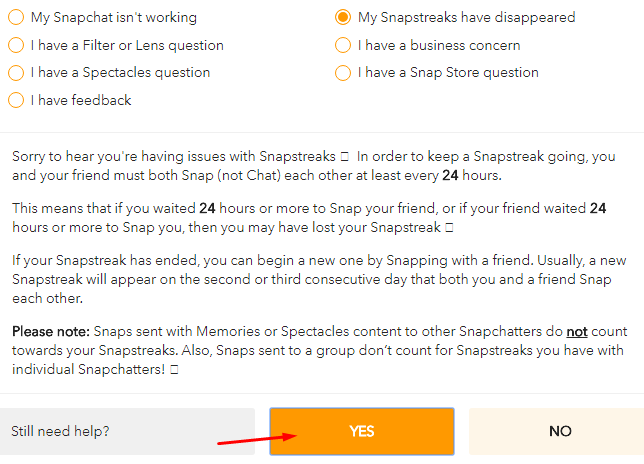 But many of you gets confused about Longest Snapchat Streak: How to Increase Snapchat Streak? Don’t worry we are here to help you out. It is known for its mind blowing features like emojis and snap streaks. You will get some points on sending or receiving snaps from your friends or any near or dear ones that adds in the rise of your overall snapchat score which is displayed on the profile below the DP of a Snapchat user. 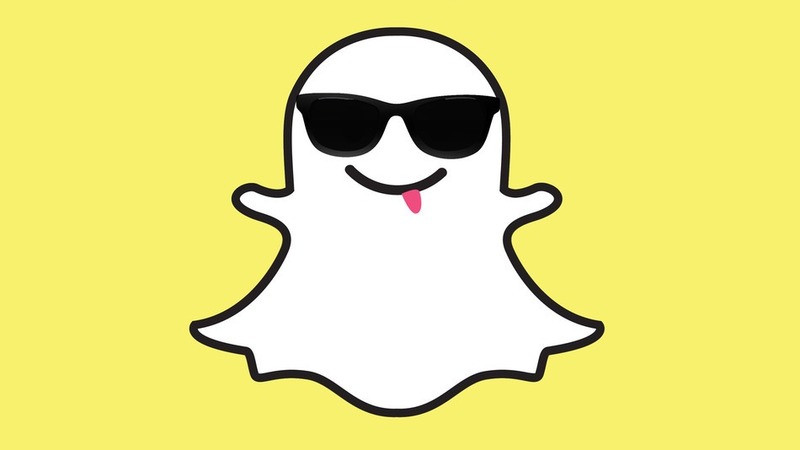 Today, in this handy guide, we are going to discuss ll the important aspects of snapchat and also the things you need to keep an eye on to let your profile shines among all the rest. So, what are we waiting for? Let’s dig in! What does snapchat streak mean? Snapchat streak is the snap produced when there is a reinforce between you and your friend once a day within 24 hours. After a time period of three days, you will get to see a fire icon beside the new number that represents your snapchat streaks. It is not easy to maintain longest snap streak. You have to maintain the streaks to maintain the snapchat highest score. What do the Emojis Mean on Snapstreaks? There are a number of snapchat emojis available. These emojis are displayed with snap streaks beside the name of your friend. The three basics of them usually are the fire streak emoji, the yellow heart streak emoji and the red heart streak emoji. Now, in this section of today’s article, we are going to discuss the meaning of longest snapchat fire streak along with the rest of the two mentioned above. You will get to see fire emoji snap streak if you snap back and forth more than one day. It clearly depicts that your relationship is on fire! Interesting though! But that doesn’t mean that there is any specific relationship is there. No! Its not like that. Relationship with any of the snapper is on fire, it means. That’s all. Longest Snapchat yellow heart Streak is also same in the case. This image appears when you snap-streak someone and get the streak back. Longest Snapchat red heart Streak is the next in the list to be discussed. Whenever you snap streak back or forth more than once in a week, the emoji is displayed automatically. How Do the Snapstreak Rewards Display? ‘Fire’ , 100 days snap streak reward ‘Hundred’ (in case you hit the 100 days Snapchat streak or your streak is on an end)are some of the emoji snapchat uses to display some of the snapstreak award display. Although there is no any trophies specified to do so but thee are some to specify feelings. Also, ‘Hourglass’ trophy is used to specify that your snapstreak is about to end or few hours are left only to send or receive streaks. How do I keep a snap streak going? longest snapchat streak ever starts when you start sending pictures and videos with your friends. It’s not tough at all but the main challenge gets into action when you need to increase the snaps and make it going. Method 1: Maintain snaps every day between you and your friends. To work on longest snapchat streak between friends, try as much as you can to send the videos as well as snaps with your friends. Make it a part of your daily habit. Remember, it’s not only you, who will keep the track of sending snaps on a regular basis but even your friends also need to actively participate in it. Your friends need to snap back to you within 24 hours otherwise you will lose your snap. If you get to see an hourglass emoji appear next to the name of your contact, then it clearly mean your streak is about to expire soon. Thus, you need to send or receive a snap between each other before the few hour left time to end. Method 2: send at least two snaps per day to avoid cleaning. You must have to send at least two snaps a day in order to avoid cleaning Snapchat as snapchat has its own rules that must be adhered to make Snapchat Streak continuous. Method 3: Send a reminder message to your friends if they late for reply. You can send your friend any video or picture to maintain thelongest snapchat streak possible. Although it’s not necessary for you to send quality images or videos. All you need to do is to send them every day. But how to remember it? I know you have a number of other stuffs as well to work. You can achieve it by using your mobile phone and putting an alert message every morning reminding you of the sending streaks. You will be notified each morning and thus will never left missing. Method 4: add a value before your friend’s name to move their snap streaks to the top. You need to add a value to your friend’s name if there is some ongoing streaks with your friends. Just add “aa” at the beginning of their names to see your friends you snaps with on the top of the contact list. How does it helps? Well it helps in sorting out the names! YES, you heard me right. After adding the initials, the contacts list will be sort by the first letter of your friend’s name and thus you will get to see the edited contacts on the top of the contact list. Not only this but also one will never forget to snap with their friends again. Method 5: sending photos or videos to your friends is better than the text messages. As mentioned above, to maintain longest snapchat streak record you need to send videos or pictures on a daily basis. Remember sending a photo or video message is better than sending a text message. So if you are sending a text to your near and dear ones, do not forget to include your any of the picture or your dog’s picture along with the text message. 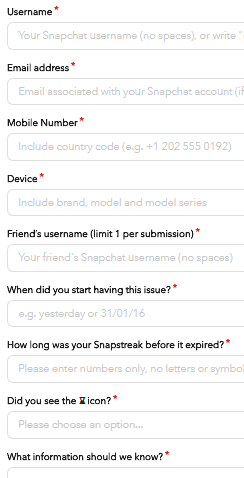 How to Get Back a Lost Snapstreak? If you have lost any of the snapstreak or your longest snapchat streak broken, then its okay, don’t worry at all. Just relax, its common though! You can get lost Snapchat streak back using these following step offered by SnapChat. Step 1: Open the official website of SnapChat and go to the support page from there. Here is the required link for it. You will get to see an image attached below. Step 2: Next, look beside the ‘Still need help?’ option and click on the YES button depicted below. Step 3: As soon as you will click on it, you will get a new window. Click on ‘My Snapstreaks have disappeared’ subject from the contact us page window shown below. Step 4: Again a ‘Still need help?’ option will appear. All you need to do is to scroll down and click on YES option again to get the longest snapchat streak. Step 5: Next, you have to fill up the contact form after clicking on the YES button. After filling it up, submit the form. Note: Take your time and Fill the details carefully! That’s all. The process is done. SnapChat will store back the lost Snapchat Streak for sure. 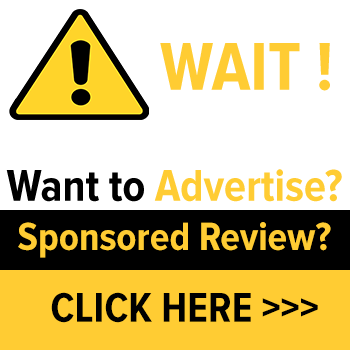 You will get a response message from Snapchat support team in maximum 24 hours. Below is the updated list of longest and highest snapchat streaks of 2018. Brandon (Score: 1049, Date: 03/18/2018). Ambyr (Score: 1049, Date: 03/18/2018). Simon (Score: 1048, Date: 03/07/2018). sydney (Score: 1043, Date: 03/06/2018). Nora (Score: 1272, Date: 06/10/2018). Robin (Score: 1128, Date: 06/08/2018). Daniel (Score: 1128, Date: 06/08/2018). Sarah (Score: 1122, Date: 06/05/2018). Miska (Score: 1121, Date: 05/16/2018). Finn (Score: 1110, Date: 05/21/2018). Jordan (Score: 1043, Date: 03/08/2018). Kara (Score: 1037, Date: 03/12/2018). Katie (Score: 1032, Date: 03/17/2018). Meig (Score: 1030, Date: 03/09/2018). Amarisa (Score: 1096, Date: 04/11/2018). Cody (Score: 1086, Date: 05/26/2018). Lane (Score: 1077, Date: 04/19/2018). Livia (Score: 1075, Date: 04/16/2018). Akayla (Score: 1070, Date: 06/11/2018). Samantha (Score: 1069, Date: 05/29/2018). Gabrielle (Score: 1057, Date: 03/13/2018). Mackenzie (Score: 1055, Date: 03/09/2018). Olivia (Score: 1049, Date: 03/14/2018). Wrap Up: How to Increase Snapchat Streak? Helloooo Guys! Hope you are doing well! So what are your plans to take your profile on to some another level? Follow Longest Snapchat Streak: How to Increase Snapchat Streak? methods described above and let your name stand out of the all. In case, you have got any doubts or confusions there to ask, don’t hesitate feel free to comment in the comment section below! Eoin Morgan write content about Technology, Social Media & other stuff on Technoven blog. When he’s not busy writing article, he enjoys traveling, playing games and adventuring.